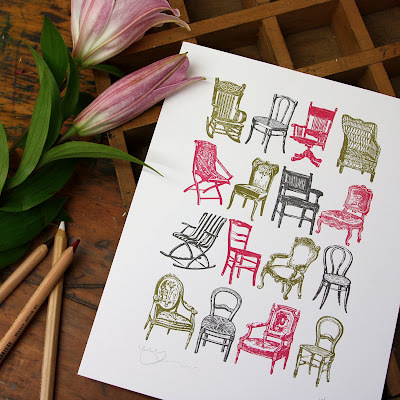 Lovely Alischa from Bespoke Letterpress Boutique has released two gorgeous new letterpress prints - antique chairs! How can you not desperately want one of these? Available in two colourways [charcoal + dark olive green + canary yellow] and [charcoal + dark olive green + magenta], the limited edition set of 100 prints come numbered and signed. 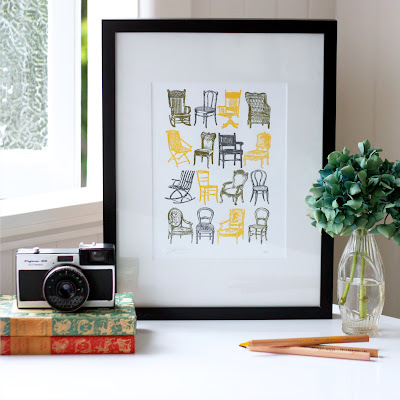 The new prints are available now from the Bespoke Letterpress Boutique online store for $30. And if you snap one up before midnight 17th April 2009 you'll receive free shipping within Australia and reduced international shipping. Delicious! As always Alischa's prints and styling are gorgeous! These are stunning! Great find! Hi Kim and finchbird - so true! The hard part is choosing which colourway... Oh and finchbird just visited your site and am in love with your jewellery. I really love these -- so nice...headed to check if they ship to USA. BTW -- in the blogging class w/ you...enjoyed stopping by. Hi Rochelle - thanks so much or visiting. I'm glad that you like Alischa's artwork; was international shipping available?